Although ice sports like hockey and ice skating aren't as popular in Kansas City as they are in many other metro areas, there are good rinks in the region, ranging from the center of Kansas City, Missouri, to the center of a park. 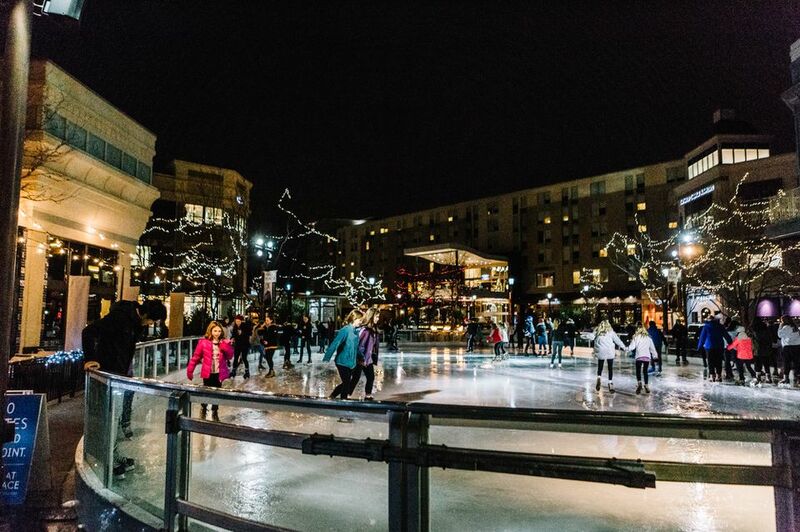 If you feel like throwing on your skates and sipping some hot cocoa during the winter months at an outdoor rink or you prefer indoor ice time year-round, you can do it all in Kansas City. All rinks close intermittently for maintenance, which can last a few days. Check their websites for maintenance closures, plus up-to-date hours, fees and contact information. Here is a list of the seasonal and year-round ice skating rinks in the Kansas City Metro area. Kansas City Ice Center is a large indoor rink that hosts year-round public skating—both ice skating and roller skating, figure skating, adult and kids' ice hockey, broomball, summer ice skating lessons and special events like birthday parties. It hosts a number of specialized, skating-related clubs. At Christmastime, guests can skate with Santa. During the coldest months, the walls are removed and only the roof and struts remain for a lovely winter wonderland atmosphere. At Christmastime, the place is decorated for the holidays and guests can skate with Santa. Admission: A nominal fee is charged for public skating and skate rental, but children four and under enter free and rent skates free of charge. All other skating fees vary by the type of activity. Operation: The Ice Center is open year-round, and each month it follows a set calendar of events. The Crown Center Ice Terrace has been around for as long as most Kansas Citians can remember, so it holds a bit of nostalgia for people who've grown up in this Missouri mecca. The outdoor terrace, which is sheltered by a beautiful white tent, overlooks the Mayor's Christmas Tree. It is open all winter long, throughout ice skating season: November through March. Locals think of this as the premier ice skating rink in the region, and they say the ice is high quality an maintained by professionals. Admission: Most skaters pay a nominal fee; those over 60 and under 5 may enter free of charge. Skaters may rent a pair of skates on-site or bring their own. Operation: For up-to-date days and times of operation, which run from morning until night, see the Ice Terrace webpage. Hours are fairly constant during the workweek, but weekend hours are extended. The rink is open on Thanksgiving Day, Christmas Eve, New Year's Eve and New Year's Day. It is closed on Christmas Day. The Ice at Park Place is a small, completely open-air rink at Park Place shopping center. The only outdoor ice rink in southern Johnson County, it is a cold-weather facility only. The Ice is surrounded by seasonal activities, restaurants with warm food and drink options, and interesting shops. The facility, open since 2008, is available for groups, birthday parties, field trips and special events with large group discounts and charitable fundraising opportunities. It hosts several special events annually including Skate with Santa days in December and a Valentine's Day Skate. Check The Ice's Facebook page for weather updates. For instance, if it is too warm outside, the rink will not open. Admission: Skaters of all ages pay the same flat fee. Group and special discounts are available on a regular basis. Skaters may rent a pair of skates on-site or bring their own. Make sure you are given standard skates with ankle support and not hockey skates. Operation: The ice rink is open from November through February, including holidays. Line Creek Community Center and Ice Arena, run by the City of Kansas City Missouri Parks & Recreation Department, is a 34,000 square-foot family recreation center located in the of Frank Vaydik Park, surrounded by woods and bordered by Line Creek. It is located in an area with plenty of family-friendly activities, including two baseball diamonds and a soccer field to the south, the KC Northern Miniature Railroad to the north and an an outdoor pool that's open seasonally. The Ice Area is an indoor facility that offers public skating, ice time, figure skating lessons, hockey lessons and clinics, and everything in between. Various skating clubs, from curling to figure skating, use the facility. Admission: Nominal daily and monthly fees are available for adults and seniors. Operation: The Ice Arena is open seven days a week all year long, and each month it follows a set calendar of events.